KJ Motorsports is a worldwide internet retailer of UTV/ATV aftermarket parts located in the tiny, unsuspecting town of Middleport, NY. Their team has completed two shop builds thus far and with each they strive to take bigger and bolder steps to do something truly unique. The canvas for this build, a 2017 Ranger 1000 XP HVAC Northstar Edition in which KJ Motorsports painted a beautiful BEAST dubbed the “TrailMaster”! An interchangeable bed slide system, Mattracks, and fully adjustable air ride suspension are just a few items to mention on this unit, with lots more to cover, so let’s dive in deeper. KJ Motorsports teamed up with SlideMaster to incorporate an interchangeable bed slide system for the Ranger. The system provides three different options to accommodate some awe-inspiring items for your time on the trail. The first option, a Shredder carrier! 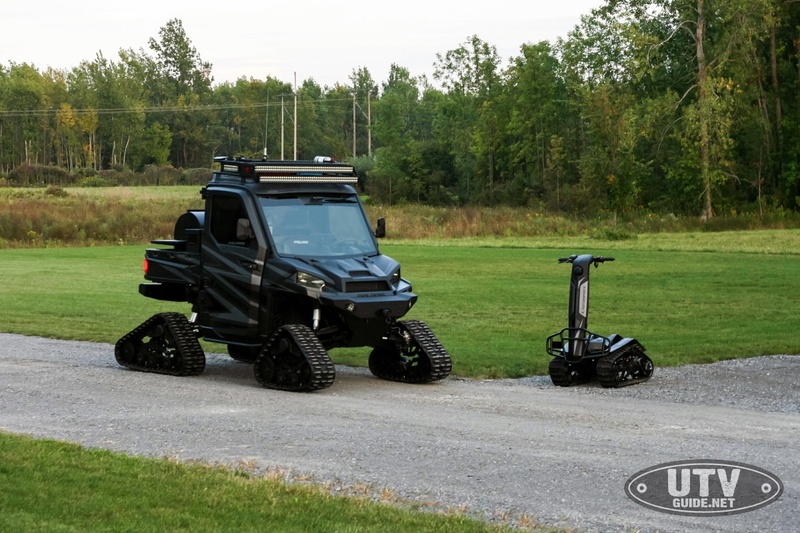 The DTV Shredder is a single person, stand up, tracked vehicle which is wrapped to match the Ranger and is perfect for playing around the camp site or hitting trails too tight for UTV’s. The second option, a propane gas grill and we’re not talking about some cute little toy you pick up at your local big box store. We are talking about a full size, professional grade, stainless steel grill that is powder coated black to match the sleek look of the unit with enough grilling space for any size crew. The third option, a full size cooler mount that easily accommodates a 70 quart cooler. Let’s face it, we all get thirsty on the trail and the TrailMaster is definitely the machine you and your crew will want to gather around to enjoy the 2,000 watt sound system while quenching your thirst. That’s right, the TrailMaster is equipped with fully adjustable air ride suspension! KJ Motorsports worked with RideTech to put this system together featuring HQ Series ShockWaves shocks. The pressure based system is fed via an ARB high performance compressor mated with custom twin 1.5 gallon stainless steel tanks; providing an endless supply of air to play with and adjust. The shocks can be adjusted from ultra-plush to super stiff and anywhere in between. The system is operated with ease via the RidePro Digital Computerized Control System from either smart phone, wireless remote, or digital controller inside the cab. Not only does the machine look gnarly when parked with the shocks aired all the way down, it also allows you to easily deploy and use the grill comfortably. With the tracks in place KJ Motosports upgraded the driveline to accommodate them with ease. 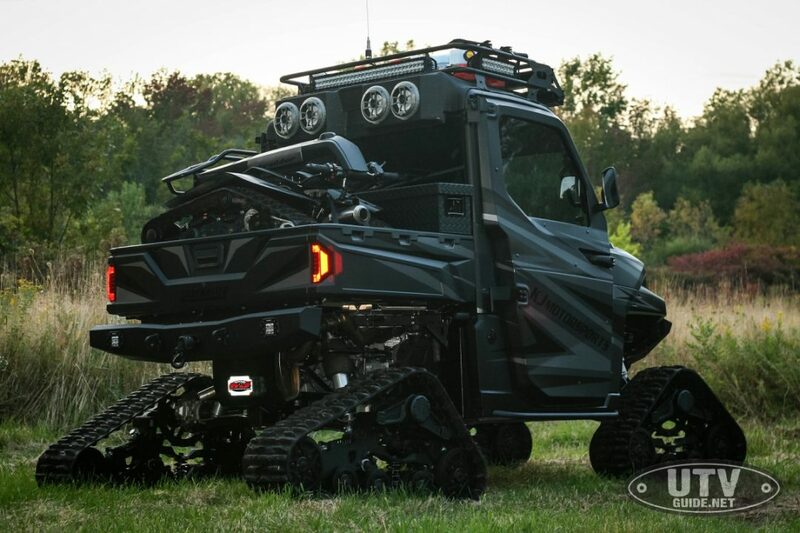 A bullet proof transmission from Gilbert Designs with turf mode delete, double reverse chains, SKF bearings, upgraded output shaft, HD bearing retainer, cryo treated gears, and case gussets were installed on the TrailMaster. Accompanied by QSC Rev-X billet primary clutch & secondary spring, Gates G-Force carbon belt, Turner Cycles Billet Front Differential & Level 2 axles, Level 2 Upgraded rear axles, Wicked Weasel Fabrication Billet 5 Finger Armature Plate for front differential, and RVS Performance Stage 1 – 91 octane ECU re-flash were all also a must to confidently put all that power to the ground through the Mattracks this tank rolls on. 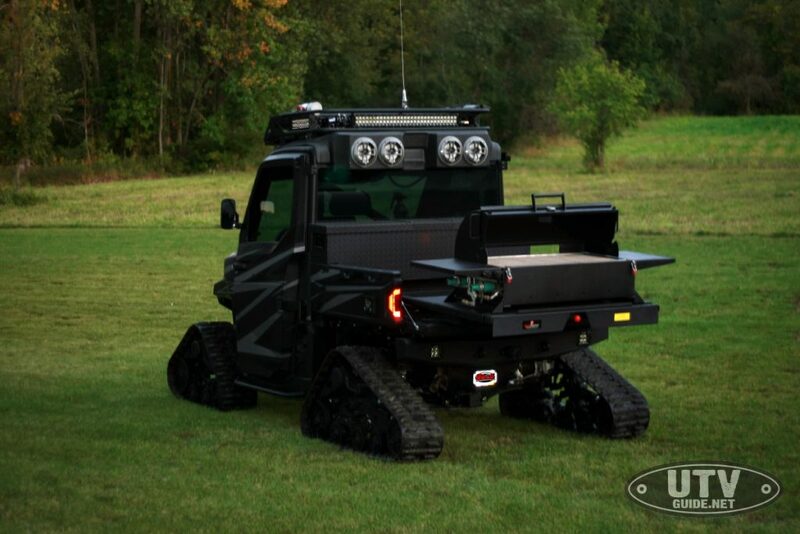 When the beef isn’t on the grill there is still plenty to be found all over this Ranger. The RuggedPRO Bolt-on Front & Rear Frame Brace Kit developed and sold by KJ Motorsports is installed for that additional support these machines are notoriously in need of. Super ATV Black High Clearance Boxed A-Arms in front and rear help the machine achieve its monstrous stance and add durability. Also from Super ATV, Wrinkle Black front and rear bumpers provide even more beef to the machines look, with the rear bumper modified to house and cover a KFI Assault series 5000 lb winch hidden inside. Another KFI Assault series winch is located in the front bumper, with a custom made bumper to skid transition plate that seamlessly mates them together. RackBoss Heavy Duty Rack and Pinion and 1/2″ UHMW Skid Plate round out the upgrades from Super ATV found on the machine. A heavily modified safari rack is mounted atop the cabin and is packed full of necessities for the trail. RotopaX 2 Gallon Water Pack and 2 Gallon Gasoline Fuel Pack ensure you will not run out of gas or water. A 2lb fire extinguisher with Axia Alloys mounts, CKRT 104491 Trencher folding shovel multi tool, and Hi-Lift 36” ATV/UTV jack with Black Jack handle keeper can also be found on the Safari rack. The TrailMaster also has a custom made, diamond plate aluminum storage box in the bed with enough space for anything else you may want to take on the trail. The TrailMaster features a tasteful yet powerful set up in both the lighting and sound departments; with the battery box fully customized to house two Odyssey 75-PC1230 Extreme Series Drycell Batteries, with a 3rd Odyssey PC680 Extreme Series Drycell Battery reserved for starting to ensure all systems have plenty of juice. Rogue4 lighting is in place with all backlighting on the machine set to blue. 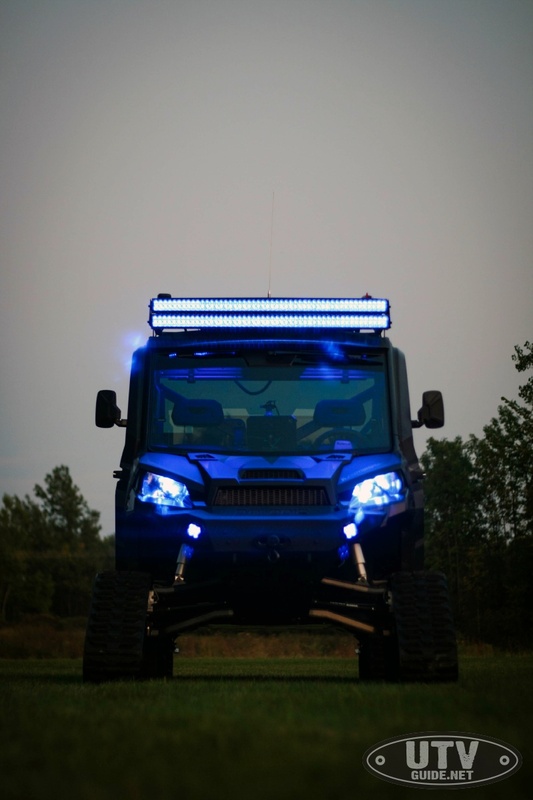 All mounted to the Safari rack; two forward facing Delta Series 50″ RGB LED Combo Light Bars, rear facing Delta Series 30″ RGB LED Combo Light Bar, and Delta Series 10″ RGB LED Combo Light Bars on both the driver and passenger side. In addition, two Bravo Series Flush Mount Mini RGB LED Flood Lights are found in both the front and rear bumpers to provide additional ground illumination on the trail. XKGLOW 2 in 1 LED Headlight Bulb Kit is also installed with the XKchrome Smartphone App-enabled Bluetooth RGB Demon Eye and LED headlight conversion to complete the TrailMasters 360-degree lighting scheme. 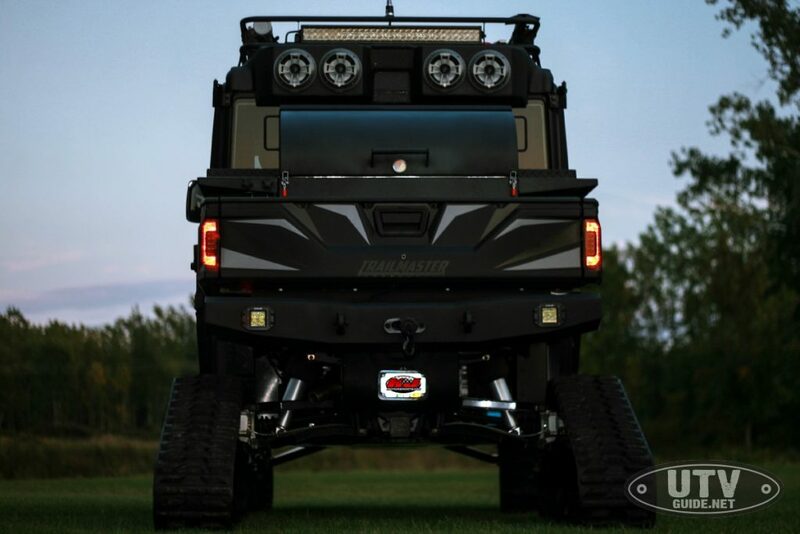 The sound system of choice on this build is from Audioformz, with a custom roof unit located on top of the cab. You will find eight Audioformz 6.5” speakers with LED rings and cones all set to blue as well. Four speakers on the outside, four on the inside, and an SSV Works Polaris Ranger XP 900/1000 Under Seat Sub Box with Rockford Fosgate Punch 10″ P3 2-Ohm DVC Subwoofer is installed to provide some additional low end boom. The Punch Marine Hide-Away AM/FM/WP Digital Media Receiver is hidden in the roof with Rockford Fosgate PMX-1R Punch Marine/Motorsport full function wired remotes with 2.7″ displays installed in the dash and on the driver’s side of the cargo bed for control from outside while chillin’ and grillin’. Four 500 watt Audioformz amps power the system yielding a total of 2,000 watts with over five feet worth of speakers pushing air! With the base of the build being an HVAC model that means the TrailMaster is also equipped with full heat and air conditioning so you can be comfortable no matter what mother nature plans on throwing at you. If a full cab with heat isn’t enough, the Heat Demon UTV Heated Steering Wheel Kit and Seat Heater Kit were installed to help battle the cold Western, NY climate the TrailMaster is native to. A 32GB iPad serves as the media hub and is armed with the Mob Armor Elite Race Series GPS Bundle that also acts as a dash mount. An ISunnao Bluetooth Media Remote Button is also installed on the steering wheel for convenient driver control of media playback on the iPad. PCI Race Radios takes care of communications between the KJ Machines via the Icom F5021 Chase Package. Polaris Rear View Camera Mirror, Remote Garage Door Opener by Homelink, and Lock & Ride® Pro Fit Poly Doors w/Power Glass Windows (30% tinted) complete the luxurious cabin of this unit. 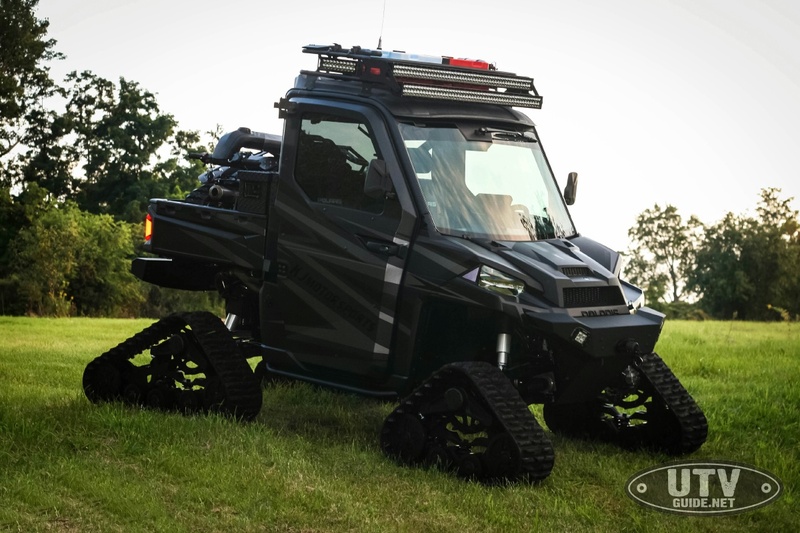 As you have read the TrailMaster is without a doubt a serious and highly detailed build. 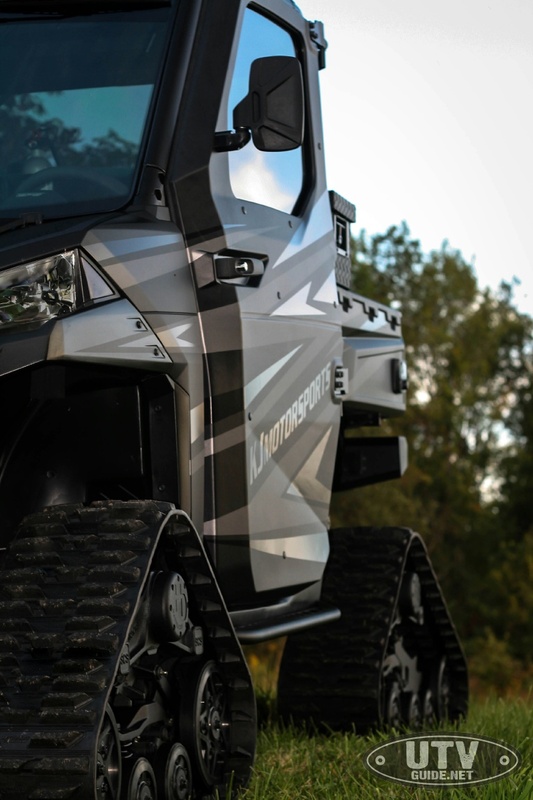 With all of its capabilities and creature comforts, this Ranger stands out from the crowd. Get the full build details of the TrailMaster and check out the other KJ Motorsports shop builds at www.KJMotorsports.com.